The Institute of Plastics Processing (IKV) in Industry and the Skilled Crafts at RWTH Aachen University will host the 2nd International Injection Molding Conference (IIMC) in Aachen, Germany on September 30 and October 1. The main topics at the conference will be innovative developments to improve the efficiency of injection molding processes. It will show how much potential is still offered by further advances and new developments in machine and process technology as well as modern methods of process and molding simulation for resource-oriented process efficiency. Energy efficiency and productivity in injection moulding are largely dependent on the design of a machine technology that is geared to the relevant product. Speakers from international companies will deal in a series of papers and presentations with the further development of established drive technologies and their intelligent combination with process data documentation and control. Through the increasing integration of different functionalities in plastic products, the level of complexity is also rising. 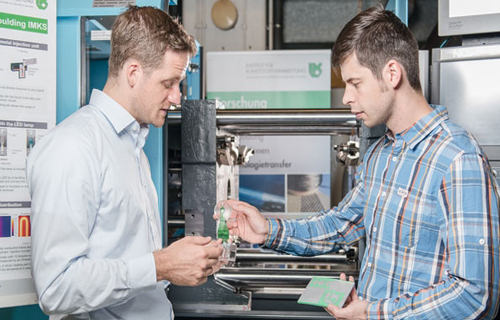 The speakers will take full account of this development in papers that deal with promising special processes such as the thermoplastic foam injection molding and integrated metal/plastic injection molding (IMKS) techniques. Increasing demands on efficiency are also being made on the design of complex plastic products. The invited speakers will show how modern simulation methods help to reduce iterations and prototype trials and increase the performance of new products. As a strategic industry event, the second IIMC aims to look at the above-mentioned technological complexes not only in isolation. The advancing use of Cyber-Physical Production Systems (CPPS) against the background of the Industry 4.0 initiative makes it possible, more intensively than in the past, to intelligently combine simulation with the complexes of machine and process technology to produce effective manufacturing systems. As a result, inconclusive efficiency assessments of separate complexes are being replaced by an evaluation of the overriding life cycle efficiency, from the very beginning of the product development to the final recycling of the product. IIMC 2015 will thus cover, for the first time in the plastics industry, the use of CPPS on a scientific basis in the field of injection molding. The speakers from seven countries will come from the following companies: Haitian, China, Arburg, KraussMaffei, M.Tec, simcon kunstofftechnische Software, all Germany; SimpaTec, France; HRSflow, Italy; Sumitomo, Japan; SABIC, Saudi Arabia; Johnson Controls, RJG, both US. Professor Christian Hopmann and his scientific staff from IKV will represent the scientific side with papers on innovative research topics.